MADISON, N.J., May 16, 2017 /PRNewswire/ -- Drug use in the American workforce, fueled by illicit drugs, reached the highest positivity rate in 12 years, according to an analysis of more than ten million workforce drug test results released today by Quest Diagnostics (NYSE: DGX), the world's leading provider of diagnostic information services. The annual Quest Diagnostics Drug Testing Index™ will be presented at the Drug and Alcohol Testing Industry Association (DATIA) annual conference this week in Orlando, Florida. Overall positivity in urine drug testing among the combined U.S. workforce in 2016 was 4.2 percent, a five percent relative increase over last year's rate of 4.0 percent, and the highest annual positivity rate since 2004 (4.5%). "This year's findings are remarkable because they show increased rates of drug positivity for the most common illicit drugs across virtually all drug test specimen types and in all testing populations," said Barry Sample, PhD, senior director, science and technology, Quest Diagnostics Employer Solutions. "Our analysis suggests that employers committed to creating a safe, drug-free work environment should be alert to the potential for drug use among their workforce." For a complete set of charts and graphs, visit www.QuestDiagnostics.com/DTI. For an interactive map that shows urine drug test positivity by 3-digit zip code in the United States, visit www.QuestDiagnostics.com/DrugMap. The positivity rate in urine testing for cocaine increased for the fourth consecutive year in the general U.S. workforce and for the second consecutive year in the federally-mandated, safety-sensitive workforce. Cocaine positivity increased 12 percent in 2016, reaching a seven-year high of 0.28 percent, compared to 0.25 percent in 2015 in the general U.S. workforce, and seven percent among federally-mandated, safety-sensitive workers to 0.28 percent, compared to 0.26 percent in 2015. "Once again, the DTI statistics reveal the on-going threat to workplace safety posed by substance abuse. While the national dialogue swirls around marijuana and opiate issues, we find cocaine—a substance with well-established dangers—continuing its troubling upswing not just in the general workforce, but in safety-sensitive jobs with federally-mandated testing," said Matt Nieman, General Counsel, Institute for a Drug-Free Workplace and Principal, Jackson Lewis P.C. "That positive test results for cocaine persist, let alone are increasing, should serve as a reminder to employers and employees that there is no substitute for vigilance in any effective effort to thwart the potential impacts of workplace substance abuse." In both the federally-mandated, safety-sensitive and the general U.S. workforces, the positivity rate for cocaine in post-accident urine drug tests was more than twice that of pre-employment drug tests, and was also higher than the rate in random drug tests. "While a positive test doesn't prove drug use caused the accident, it raises the question as to whether it played a role," said Dr. Sample. Marijuana positivity continued its upward climb in both the federally-mandated, safety-sensitive and general U.S. workforces. In oral fluid testing, which detects recent drug use, marijuana positivity increased nearly 75 percent, from 5.1 percent in 2013 to 8.9 percent in 2016 in the general U.S. workforce. Marijuana positivity also increased in both urine testing (2.4% in 2015 versus 2.5% in 2016) and hair testing (7.0% in 2015 versus 7.3% in 2016) in the same population. 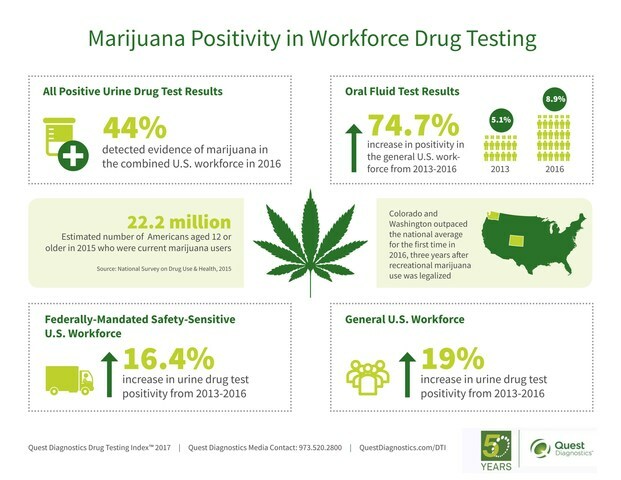 Among the federally-mandated, safety-sensitive workforce, which only utilizes urine testing, marijuana positivity increased nearly ten percent (0.71% in 2015 versus 0.78% in 2016), the largest year-over-year increase in five years. In Colorado and Washington, the first states in which recreational marijuana use was legalized, the overall urine positivity rate for marijuana outpaced the national average in 2016 for the first time since the statutes took effect. The increase was more pronounced in Colorado, which increased 11 percent (2.61% in 2015 versus 2.90% in 2016), than in Washington, which increased nine percent (2.82% in 2015 versus 3.08% in 2016). The national positivity rate for marijuana in the general U.S. workforce in urine testing increased four percent (2.4% in 2015 compared to 2.5% in 2016). "We have been tracking the trends in marijuana positivity in states that have passed medical and recreational marijuana use statutes for several years now. 2016 is the first year since Colorado and Washington approved recreational use that the rates of year-over-year change were sharply higher than the national average," said Dr. Sample. Amphetamines (which includes amphetamine and methamphetamine) positivity continued its year-over-year upward trend, increasing more than eight percent in urine testing in both the general U.S. and federally-mandated, safety-sensitive workforces compared to 2015. Throughout the last decade, this rise has been driven primarily by amphetamine use which includes certain prescription drugs such as Adderall®. Although methamphetamine positivity in urine testing declined between 2005 and 2008, the positivity rate plateaued between 2008 and 2012, and has increased steadily since. Between 2012 and 2016, it climbed 64 percent in the general U.S. workforce and 14 percent among federally-mandated, safety-sensitive workers. In oral fluid, methamphetamines positivity increased 75 percent between 2013 (0.24%) and 2016 (0.42%). After four straight years of increases, in 2016, urine testing positivity for heroin, indicated by the presence of the 6-acetylmorphine (6-AM) metabolite, held steady in the general U.S. workforce and declined slightly among federally-mandated, safety-sensitive workers. Prescription opiate positivity – including hydrocodone, hydromorphone and oxycodones – declined in urine testing among the general U.S. workforce. Oxycodones have exhibited four consecutive years of declines, dropping 28 percent from 0.96 percent in 2012 to 0.69 percent in 2016. Hydrocodone and hydromorphone both showed double-digit declines in both 2015 and 2016 (0.92% in 2015 to 0.81% in 2016) and (0.67% in 2015 to 0.59% in 2016), respectively. In recent years, state and federal authorities have instituted efforts to more tightly control opiate prescribing in order to address the opioid crisis. The Quest Diagnostics Drug Testing Index (DTI) examines test results according to three categories of workers: federally-mandated, safety-sensitive workers; the general workforce; and the combined U.S. workforce. Federally-mandated, safety-sensitive workers include pilots, bus and truck drivers, and workers in nuclear power plants, for whom routine drug testing is mandated by the U.S. Department of Transportation and the Nuclear Regulatory Commission. Quest Diagnostics has analyzed annual workplace drug testing data since 1988. 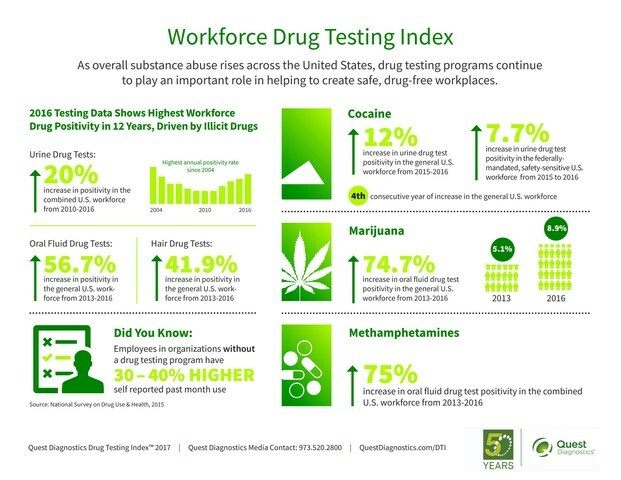 The strengths of the Drug Testing Index analysis include its large, nationally representative sample size, longitudinal monitoring, a testing population that is generally reflective of the U.S. workforce and the quality of the company's drug testing services to confirm positive results. Limitations include analysis only of employers that perform drug testing with the company and a lack of exact cross-specimen comparisons due to variations in substances for which employers test. Quest Diagnostics has analyzed annual workplace drug testing data since 1988, and publishes the findings as a public service. www.QuestDiagnostics.com/DTI.